Jaylib was the duo formed by producers Madlib, and the late J Dilla. According to legend, the duo of Jaylib began in 2000 when DJ J Rocc (of the Beat Junkies) passed a beat tape (an instrumental CD with unused beats) to Madlib. These beats happened to be by none other than J Dilla. An enthusiastic Madlib then recorded over these beats and labeled them "Jaylib", without the intention of actually releasing them. After Stones Throw placed one of these recordings on a mixtape (under the name Jaylib), and J Dilla caught ear of this, the full collaboration began to blossom. 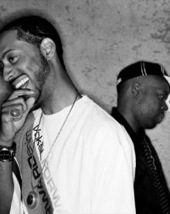 The pair recorded their debut album, Champion Sound, in separate cities (Madlib in L.A., and Dilla in Detroit) while sending beats back and forth. The greatly anticipated album was eventually released in 2003 after much delay (due to leaks and bootlegs) and received positive reviews.